My good friend from college….Samantha is coming today for my bridal shower my cousins are throwing for me on Saturday. Sam will leave on Sunday. I’m thrilled because it’s almost never that we get out-of-town visitors and it’s always fun to show people around. Tomorrow Alex and I both have the day off…..I think we’ll start off with brunch at South Congress Cafe and then just go from there! I wish the weather were a smidge warmer so we could do something involving water and bathing suits. But summer will be here soon enough in which case I’ll be wishing the triple digits away! In other news, I was flabbergasted (yes flabbergasted) yesterday when I learned that my dear friend Alec had never tried a corn dog……in all her 23 years!!! The news made both Alex and I sad because of how much we adore said dogs. When I was young I’d always turn my snotty nose up to the prized breaded weiner on a stick….it wasn’t until late that I’ve truly started to LOVE them. It’s just one of those weird things…you don’t know why it is you feel so strongly about something. 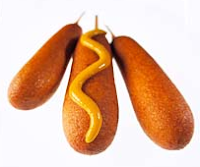 Even the last time I was at a fancy seafood restaurant I was bold enough to try the lobster corn dog with a mango ketchup…..they were fantastic by the way :-) And I’m going to throw it out there that mustard is the only acceptable condiment for corn dogs…..well that and mango ketchup! 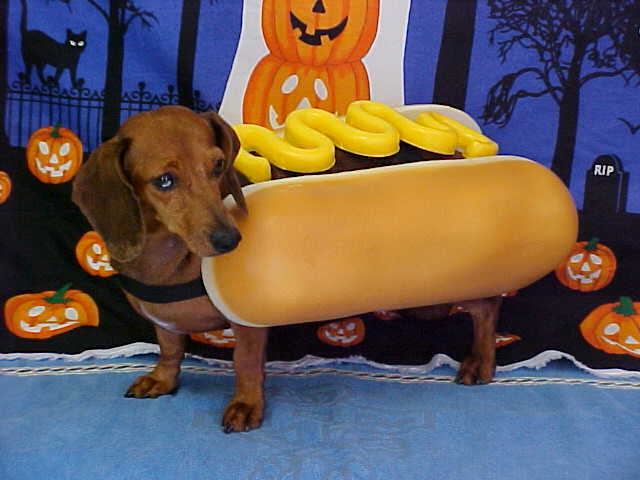 Anywho, I’m sorry for the digressing of sorts but if you’d like some corn dog history go here. Alex and I both took this past Friday off so we (including my mom and dad) could make a trip to Houston to pick up the last piece of paperwork needed here in the U.S. for our marriage in Italy. We drove the 3 hours down to Houston Thursday evening, forcing us to DVR Lost and the Democratic Debate which was in Austin. (we’ve been back for three hours and still have to watch both……ahhhh I need to catch up)!!! Anywho, Friday morning we all woke up pretty early and drove to downtown Houston from my dad’s apartment for our appointment at the Italian Consulate. I was a little anxious…..as I always get when visiting that consulate but luckily there was no reason for it. Everything went without a hitch and the lovely Daniele Ansaldo had the document waiting for us and we just had to show him documentation, have my parents declare that we were “fit” to marry, and paid the $20.95. And we were done! YAY. Horray! and then took Saci to the beach for the first time. She LOVED it. It was the perfect day…….no warmer than 72 degrees and sunny skies. There were others out on the beach enjoying the day and Saci ran around likely a crazy puppy :-) She definitely felt freedom as she reached top running speeds and splashed around in the surf. Later than night we went out for some Mexican and then saw “Defnitely, Maybe.” It was cute…Alex and I both love Ryan Reynolds, especially how he consistently delivers his lines. nments. Home is so awesome! Tonight we’re gonna go see “Be Kind Rewind” at the Drafthouse and hopefully at least watch LOST! …with the whole blog thing lately! A good deal is happening and I feel like I have a lot to talk about but I’m just not putting in the time. I’ve actually had a mental list going for a good while, of things I need to “blog” down. So here goes. I’ve been really interested and drawn to the Presidential election lately. I’m so ready to care about who’s in the White House. I keep on telling people that I get chills even thinking about the possibility of having Obama in there. It’s been eight years of me not caring about our leader and even feeling as if I don’t have one because….c’mon, I just don’t look to the guy for hope or change. Also, I’m not opposed horribly to having Hillary in the White House, I just really think our country needs some dang CHANGE. My entire life there has either been a Bush or Clinton in the White House……really???? yes, it’s true, enough already! ed my vote in my first Primary ever! It felt good, very grown up, and a little too simple. I wanted some type of siren to sound……or at least an “I Voted” sticker (which were nowhere to be seen…whatever). 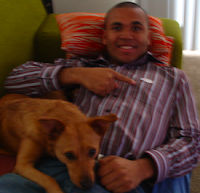 Alex on the other hand casted his vote today and as you can see…..he got a sticker! was no special alterations of anything being made, just off the shelf. Oh well, besides some material being taken WAY IN on the top I think it looks great. I stood on the little “bride-to-be” pedestal they have at those bridal shops during my lunch break and gave it the once over “once” more. 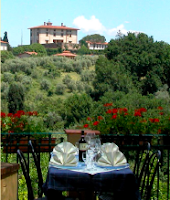 and parmesan cheese, mixed salad, fresh fruit cake, and served with Chianti “Frescobaldi”, coffee, and limoncello! For the past two years Alex and I have been celebrating the big VDay on February 13th…basically it allows us to get reservations at whichever restaurant we want and we get to avoid some of the crowds. Whatever, we had to wait an extra hour because of this and were finally seated around 7:45 (hmph)! In the meantime we strolled around shops on SoCo. We started our meal off with an appetizer plate of salami, house cured olives, mozzarella, arugula salad, and foccaccia. The plate was great and the flavors (esp. those of the salami) brought us both RIGHT BACK! For the main course I ordered ricotta/spinach ravioli while Alex had the Bolognese Lasagna. Since this place is known for being super-authentic we were both a little surprised by the mountain of mozzarella melted over each plate. I practically had to break out the excavating tools to find my ravioli. Both dishes were good……we just expected a teensy bit better! And for dolci I ordered the chocolate creme brulee which was reminiscent of really thick chocolate pudding. We both had leftovers boxed up and we left for home. However, halfway home I realized we left our boxed leftovers on the table……argh, so frustrating! For the “real” Vday we played it low key at the casa and made “Love Tacos” and watched Lost, which by the way blew my socks off………I now have 5,395 new questions and 22 answers. Gah, it’s just soooo good! To all of you out there experiencing the normal frigid temps winter brings along……I’m sorry! Austin, Texas really delivered today and made me remember all over again why I love living here. We always experience broad temperature spreads here……it’s how we do it :-) This morning I started off the day in the sunshine (per usual) but with a long sleeved tee, sweat pants, and a jacket when I took Saci out for her morning “business” run. Fast forward to 12:15ish (my lunch break) and it was no cooler than 82…..I was near sweating in my jean jacket. But that was fine by me. Once we got home I slipped on shorts and a tank top and lounged by the pool (even though it was freezing) and then went on a long job with Alex and the dog. So are Alex and I considered “foodies?” I’ve heard the term “foody” thrown around a bit and I think it may be a good term for both of us. Ya know, those who appreciate good cuisine and seek it out! Anyway, this past Friday evening Alex and I did our usual date night and tried out Bess Bistro. The owner is none other than Sandra Bullock, one of Austin’s more famous inhabitants. If you don’t know where the restaurant is exactly off of Sixth Street you’ll miss it for sure. It has an unassuming awning and steps that lead eaters and other local “foodies” down into the basement of the above building. The lighting is very low and sets a very relaxing, low key mood. The cuisine could best be described as Classic American Comfort Food meets French Bistro. We tried their Macaroni and Cheese Gratin which was insanely rich and delicious for the first 4-5 bites but then became a little overwhelming. Alex ordered the Friday special which was the Fish and Chips while I went a wee bit more sophisticated and ordered the Porcini encrusted Halibut which couldn’t have been more disappointing. I chose that item on the menu because it seemed exciting and interesting. It turned out to be boring and bland…ugh hate when that happens! On a more positive note, Alex’s coworker was taking pictures of honeycomb for a project they’re working on and Alex was able to bring it home with him for me to try. Has anyone out there ever tried real, fresh honeycomb? I hadn’t until today and it was amazing, it was instantly satisfying and I love the texture. It’s strange to eat the “comb” but they melt in your mouth! Unfortunately I caught a peek at the price tag of about $9 for a very small amount. I better enjoy what’s left while it lasts! Mostly I’m grinning ear-to-ear happy for my dad! The biggest Giants fan I’ll ever know. Despite Eli Manning’s sloppiness last season and for 3/4 of this past season he stuck with them (despite the Sailor-like cursing) and stuck it out in the end. We had 8 people in all at our house……just the fam and two friends. My dad had Giants gear set out for a lot of us to wear. He owns an unGodly amount of Giants apparel! He was boisterous and passionate the entire game…..I had to grin sometimes when the other team made a great play in that he really handles the bad like a child sometimes, it’s endearing in a way! Because I’m weirdly superstitious when I want certain sporting events to go my way I had a lucky napkin and lucky sitting position. I know…a little half-past crazy but whatever! When the Giants finally had the game safely tucked away the familia went NUTS! There was lots of screaming, high fives, and “Yes’s” to go around! During the Post-game show the neighbor (a die hard Cowboys fan who always taunts my dad’s Giants) came over to congratulate my dad on the win with a bottle of champagne! We all toasted and ate Nutella Trifle! Of course, it’s the dessert of champions!